That Business Show enters week 16 today – airing weekdays at 8am on 1250WHNZ and live anywhere in the world via the iHeart Media app on your smart phone or live online at http://www.tampabayradio.com. On the first half of today’s show, I welcomed Karen McAllister, Media Relations Manager with AT&T. Karen serves the Tampa Bay and Southwest Florida area as Media Relations Manager and has 20+years of experience in journalism and managing news websites. Karen and I kicked off the show with a discussion of hurricane readiness tips for small business owners and I recalled a story from 2004 when the Tampa Bay region experienced a severe storm season from my days in industry at Cargill, later renamed to Mosaic, in which inadequate engineering led to a breach of the acidic pond water system on the site and the storm’s rains caused the water to overflow from the gypsum stacks upon which it sat and ran into the Alafia River. This environmental disaster cost the company millions in fines and re-engineering and is an example of a business that was not “hurricane ready” Businesses need to prepare for the hurricane season just as a homeowner does and Karen and I discuss several other tips for the listeners. On the 2nd segment, we discussed AT&T’s “It Can Wait” campaign which is national campaign geared towards young adults and getting them to take a pledge against texting and driving. Karen frequently discusses the topic with the youth in our schools and she shared with us the AT&T mobile app that senses when you are driving and restricts incoming text messages and replies to them with a message telling the person that you are driving and will reply when you are stopped. #X was mentioned and is a national social media campaign pushed by AT&T that when used tells the user that you are driving and will pick up the conversation later. 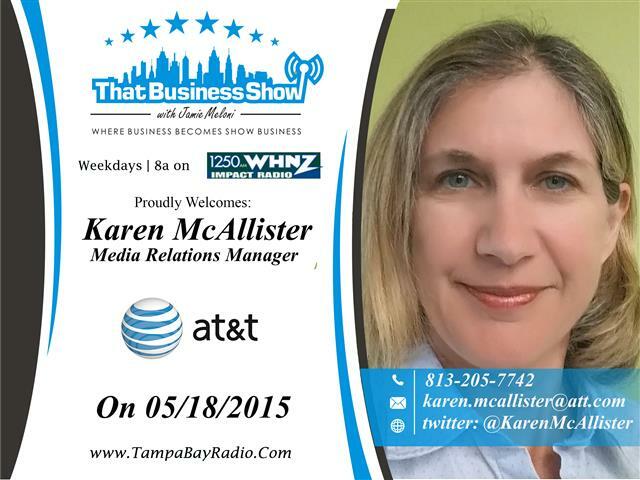 Karen McAllister is available for media interviews on mobile technology and products and any media questions related to AT&T and can be reached at 813-205-7742 or email at Karen.mcallister@att.com.